There is no doubt that August does not trust imperialism either. 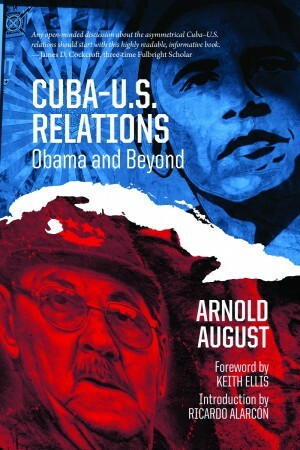 The main focus of the book is an informed assessment of the scope and impact of the historic three-day visit to Cuba by a U.S. president in nearly a century in March 21, 2015 following joint declarations by presidents Barack Obama and Raul Castro on December 17, 2014 (17D) to re-establish Cuba-U.S. diplomatic relations. Much of the content presented in the book is based on articles written by the author in recent years, which shows August’s long-standing study, research and foresight about many aspects of Cuba U.S. relations. For example, he condenses six of his previous articles in the first chapter to set the stage for the “historical/political context” going back to the inception of U.S. policy on Cuba. This is a good memory refresher and a clear response to Obama’s much-criticized stance during his visit asking Cubans to forget the long history of constant U.S. intentions to annex the island, and the subversion attempts against the Cuban Revolution. Throughout the book one gets the feeling that the author writes from a solid Cuban standpoint as someone who has close knowledge of current events in the country and follows its political pulse. This does not make it a biased book, rather a book that gives Cubans a voice that has been silenced by the Western media for almost 60 years. This personal perception is corroborated by a full chapter dedicated to interviews with five Cuban authors and analysts who are active writers and bloggers, and who “contribute one or more specific perspectives” on Cuba-U.S. relations. This is a sentiment fully shared by August. In addition to the more obvious danger of an incipient “private sector” that could be easily co-opted by the U.S. to undermine the socialist system, August also refers to the subtler World Learning initiative for “leadership” training launched by the U.S. Agency for International Development as moving “from aggression to seduction” of Cuban youth. It is not a secret that within Cuba there is an ongoing broad debate about the hope for Cuba-U.S. relations. It is evident that August decided to make his book part of that debate and does not shy away from a direct challenge to those Cubans whom he perceives to have “the mindset that assists the U.S. in subtly introducing its new tactics to achieve its same goal of regime change.” This may also be a challenge for the reader. The book was published before we learned of U.S. President Trump’s much-publicized announcement of “reversal” of Obama’s policies towards Cuba. However, it is still a timely read mostly because Obama’s policy changes were more cosmetic than substantial. While the respective embassies remain open, the small concession for U.S. citizens to be able to travel to Cuba under fewer restrictions is now gone. The bulk of the U.S. blockade on Cuba was never changed and the U.S. occupied territory of Guantanamo has not been returned. Also remains the U.S. government continued goal of regime change in Cuba. Will this push some Cubans to “miss” Obama’s rhetoric about Cuba? Will it confirm without doubt the long history of Cuba-U.S. relations and help close ranks around socialism? At this particular time – when Cuba fights back the continued economic challenges, and the ongoing U.S. designs on the island, when Cuba brings about the necessary changes established by the Lineamientos (Guidelines), when Cuba moves towards its new social economic model while preserving the socialist system, and when Cuba is about to experience the first government without the historical leadership of the revolution to take place in 2018 – those of us in the Cuba solidarity movement must be alert but never fail to trust that Cubans are at the frontline of the Cuban Revolution. In order to do that we must support and rally for strong unity while the dialogue and debates will continue on and off the island.